Identification: Two tails on the hindwing. 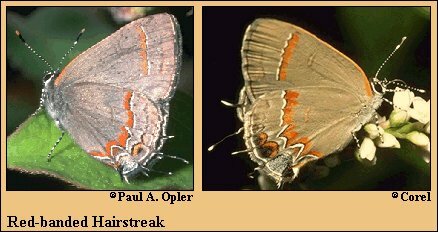 Upperside brown, hindwing blue. Underside gray-brown with white postmedian line edged with red-orange. Life history: Males perch on shrubs and low trees to watch for females. Females lay eggs singly on underside of fallen leaves near the host plant. Caterpillars feed on leaves and buds and probably detritus. Chrysalids and fourth-stage caterpillars hibernate. Flight: All year in Florida, two broods northward from April-October. Caterpillar hosts: Fallen leaves of wax myrtle (Myrica cerifera), dwarf sumac (Rhus copallina), staghorn sumac (R. typhina), and several oaks. Adult food: Flower nectar from yarrow, wild cherry, tickseed sunflower, sumac, sweet pepperbush, New Jersey tea, common milkweed, and dogbane. Habitat: Coastal hammocks, overgrown fields, forest edges. Range: Southeastern United States from Long Island south through Florida, west through entire area to southeast Kansas, eastern Oklahoma, and eastern Texas. Strays to eastern Nebraska, northern Illinois, and Michigan.